Scattered farms and halls on wooded limestone crags on south-western side of vale with linear fields created by gradual clearance of the natural woodland. The earliest human activity in the area is represented by a number of Bronze Age tools and weapons including a bronze axes found in the woodland at Coed Marchan and to the south of Plas-uchaf and a bronze dagger probably found near Craig-adwy-wynt and a Bronze Age burial cairn to the north of Ty'n Llanfair. The earliest evidence of settlement is provided by the Iron Age hillfort at Craig-adwy-wynt, on the high limestone crag on the western boundary of the character area. The character area falls within the medieval ecclesiastical parishes of Llanfwrog, part of the eastern side of Efenechtyd and the south-west corner of the medieval parish of Llanbedr Dyffryn Clwyd, within the commotes of Colion and Llannerch in the ancient cantref of Dyffryn Clwyd. Dominated by north-south wooded limestone crags rising to a height of about 190m OD, with fields formed in the narrow valleys between the crags, varying in height between about 80-170m. Present-day settlement is represented by a small number of scattered halls and generally larger farmhouses and a nucleated settlement of 18th- and 19th-century cottages including miners' cottages and 19th-century chapel at Craig-adwy-wynt. The earliest building evidence appears to be represented by a possibly 15th- or 16th-century stone-built house at Eyarth Hall, enlarged by a timber-framed house of late 16th and early 17th-century date, to which were added an 18th-century former coach house with mostly stone-built 18th or earlier 19th-century farm buildings to the north-west of the house. 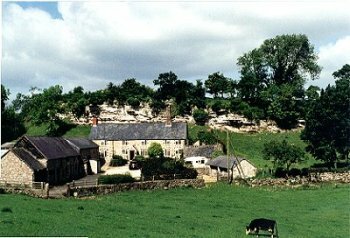 18th/19th-century stone farmhouse and outbuildings at Bron Eyarth Farm. Llwyn-ynn was similarly a large timber-framed 17th-century house but has now largely been demolished. Eyarth House is of early 19th century date, with a stuccoed front. An old bee bole for holding a bee hive is recorded at Ty Derwin. There are more extensive areas of woodland including Coed Marchan, Coed-y-galchog, Coed-y-gawen, and Coed Aston in the northern part of the character area, classed as ancient semi-natural woodland and ancient replanted woodland. Coed Marchan ('Coidmarchan') was classed as reserved woodland during the medieval period and is referred to as 'Parke Coed Marchan' in 1655, dilapidated, mortared limestone walls running through part of the woodland possibly being a rebuilding of the 'deer park wall' described at that time. Narrow spinnies and linear strips of deciduous woodland on the limestone crags in the southern part of the character area, such as Eyarth House Wood, Coppice Wood, Coed y Parc, Coed Pen-y-graig, Hirglust Wood and Graig-ddyrys Wood represent the survival of a more extensive areas of native woodland of which parts at Eyarth and Faenol were rigorously maintained as reserved woodland and forest under the direct authority of the lordship of Ruthin, and bordered on the east by Bryncyffo ('Brenkgif)' where the supporters of Owain Glyn Dwr had their hide-out in 1411. Part of the area was still referred to as 'Forest Eyarth' in 1603. The relatively small and irregular fields around Bron Eyarth Farm and the more regular fields around Eyarth Hall defined by hawthorn hedges. Relatively large and linear meadows between existing areas of woodland towards the southern end of the character area have the appearance of having been created by the gradual felling and exploitation of the native woodland as a source of building material and fuel. Boulder-revetted lynchets on some of the steeper ground. Plots of enclosed land on Craig-adwy-wynt and on the western side of Graig-ddyrys are shown on the enclosure award of 1853. The production of agricultural lime from the local limestone is represented by a number of disused limekilns of probable 18th- and 19th-century date scattered throughout the southern part of the area, no doubt exploiting the local woodland for fuel. There is a single 19th-century chapel in the small nucleated settlement at Craig-adwy-wynt.